‎It takes dedication and passion to excel at an intensive sport like skateboarding, so much so that the conquest of excellence becomes an athletes’ whole life. 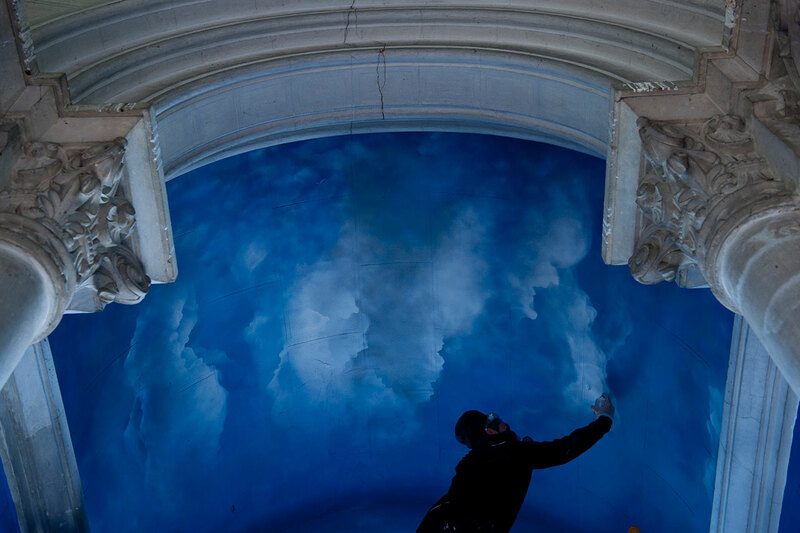 Such commitment is also required from an artist in order to perfect their talent due to the fact that an artist’s hand is an external reflection of the his or her's internal world. 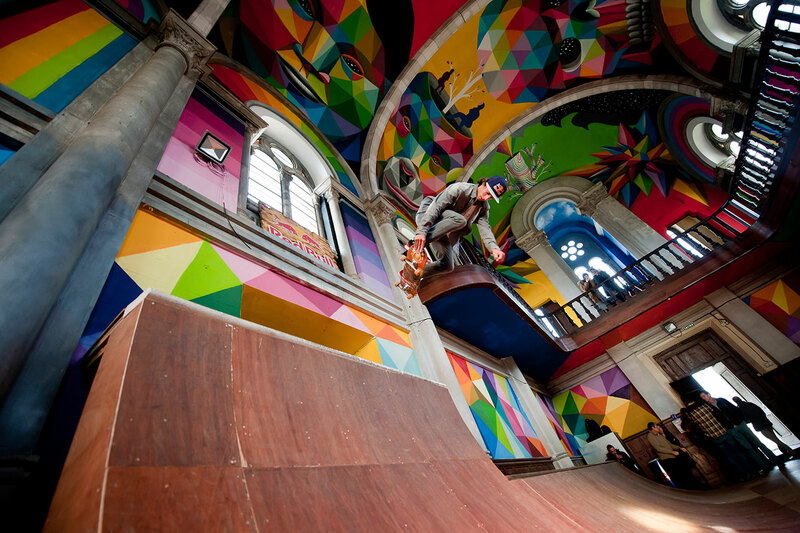 And it these two forms of devotion that perfectly coexist in Spain’s, La Iglesia Skate. 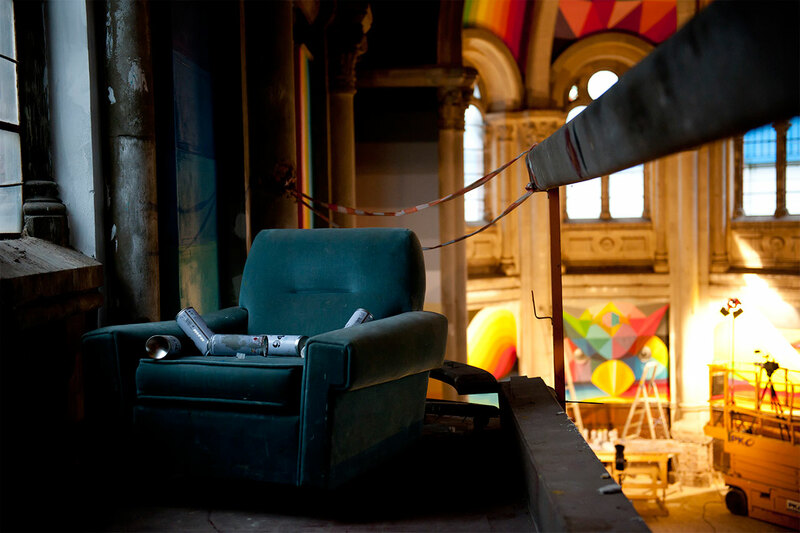 The original church, Santa Barbara, was built in 1912 as part of the complex which housed the workers of the explosives factory of Llanera in Asturias. However, at the end of the Spanish Civil War the company closed down and the worker’s community, including its church, was abandoned. Fast forward nearly 100 years and the church was acquired by a collective of skate loving friends known as The Church Brigade. 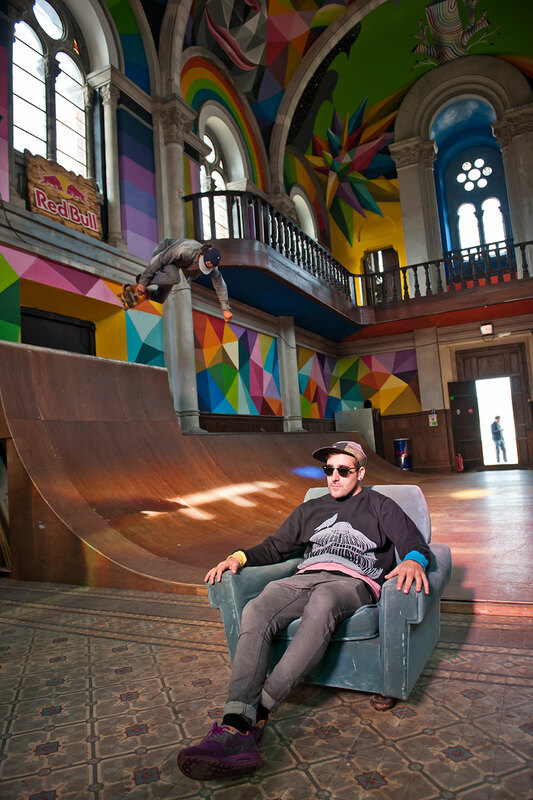 Envisioning the building’s high vaulted ceilings as the perfect nest for a skateboard ramp, they decided to build one within its walls. This was an entirely DIY effort the realization of which required hosting concerts, barbecues and skate championships. 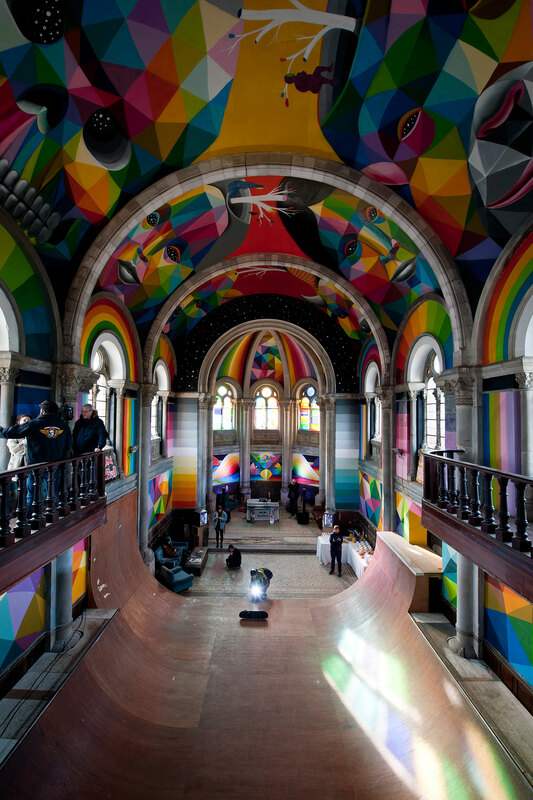 But their dedication paid off and the Church Brigade managed to shape the spot as a destination for skate culture aficionados. 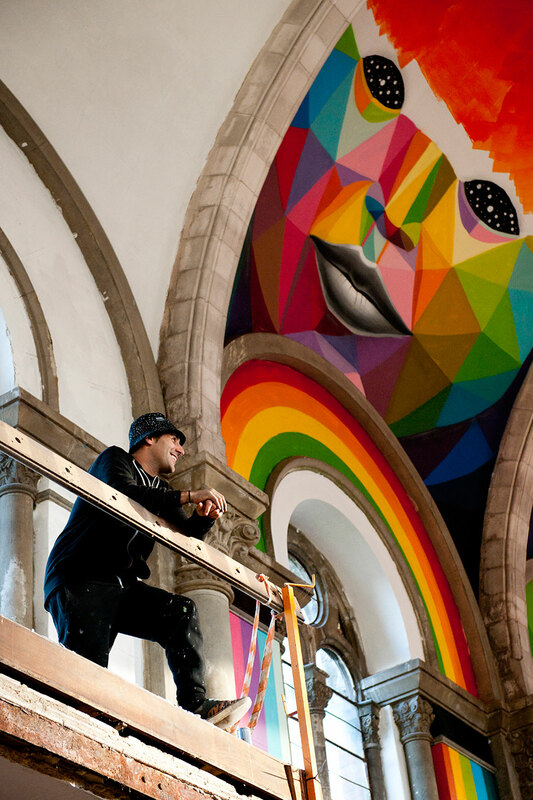 In late 2014, internationally renowned Spanish artist, Okuda San Miguel, was introduced to the skate church by a friend and after visiting it knew that he wanted to add his own personal touch. 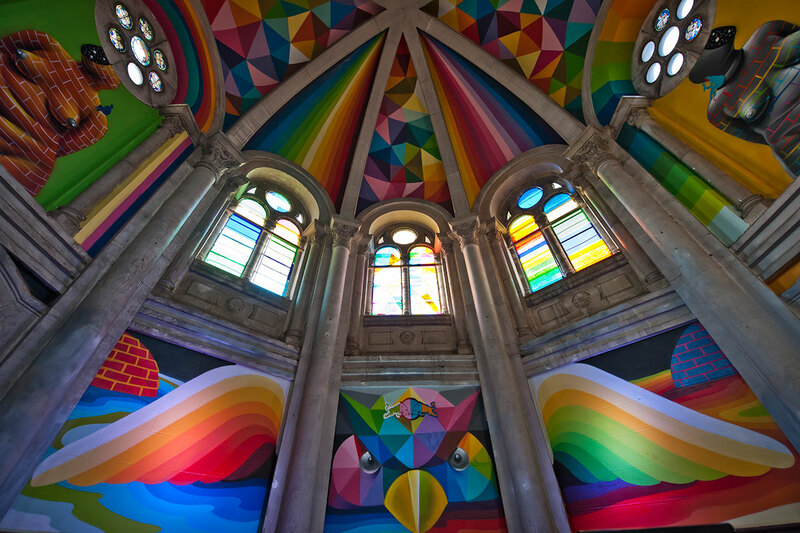 His iconic Kaos Star, a characteristically colorful, asymmetric compass, which features prominently in his murals, became the source of the church’s new name, the Kaos Temple. 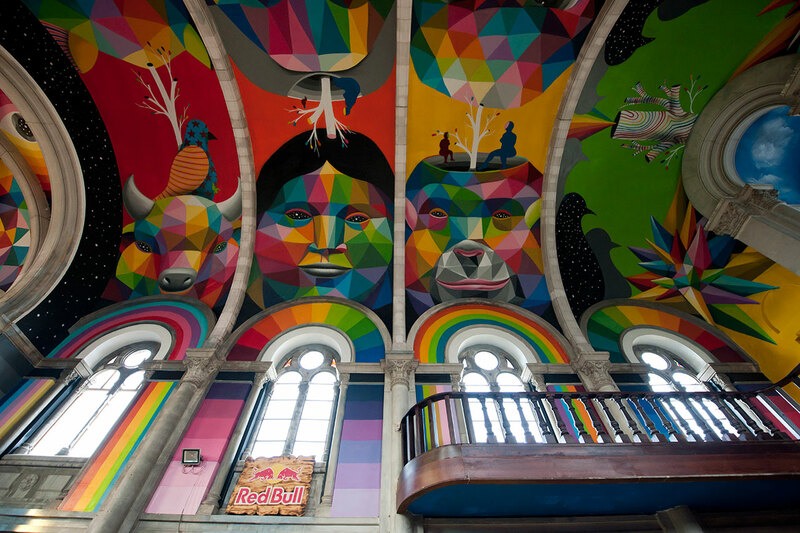 Undoubtedly, this work is the most significant of Okuda’s career thus far. 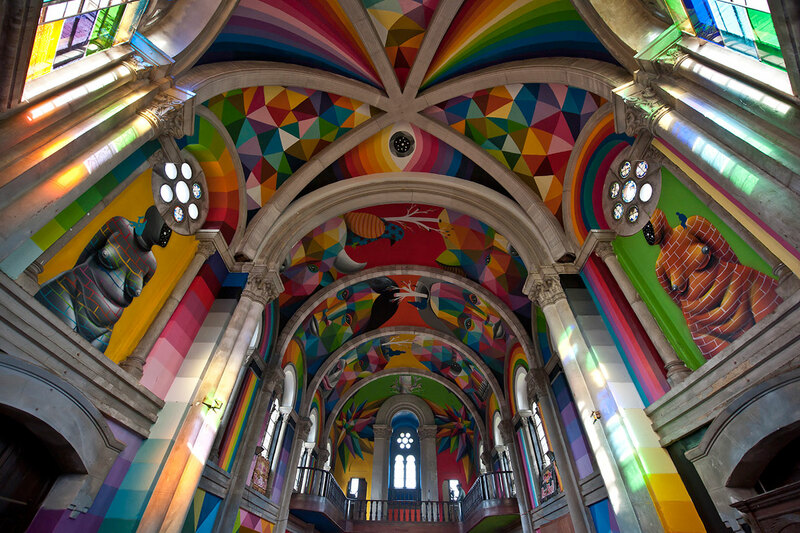 Okuda, an artist who began by painting on abandoned walls in the small Spanish town of Santander and who later studied fine art in Madrid, has described the Kaos Temple as, “My personal Sistine Chapel,” and it’s easy to see why. Produced by Ink and Movement, his management and communication team, as well as with the collaboration of Church Brigade, Okuda et al were able to host the project on the crowdfunding platform Verkami. 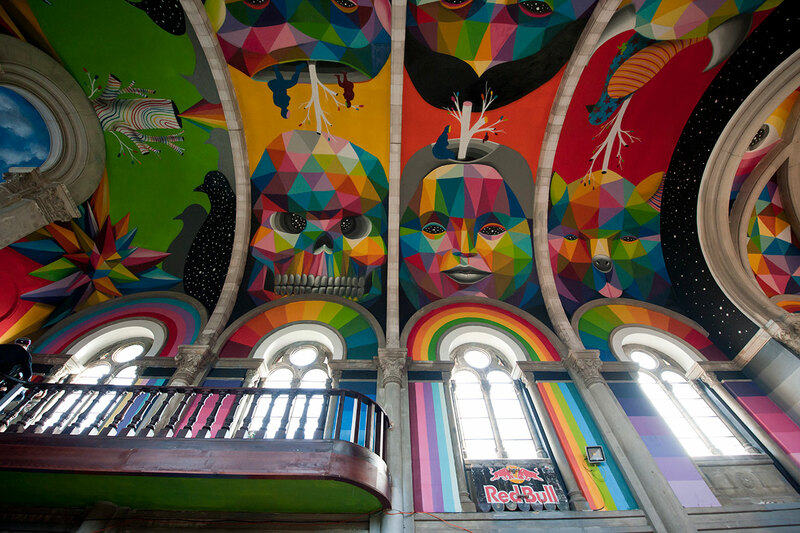 Ensuring the right sponsor was important to Okuda so Red Bull’s participation in this feat of modern art was a perfect match. 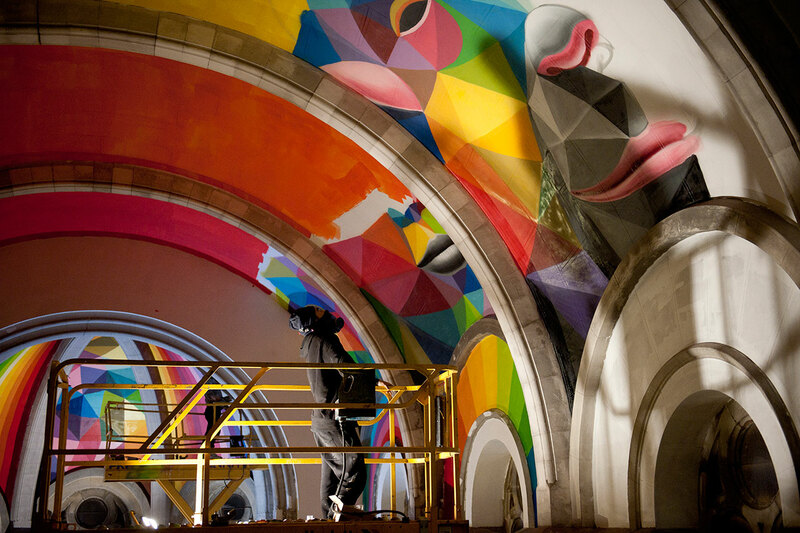 Skateboard maker, Miller Division, paint brand, Montana Colors and sock brand, Socketines (who even produced a special edition pair of socks featuring Okuda’s distinctive, color blocked geometric designs) also collaborated. 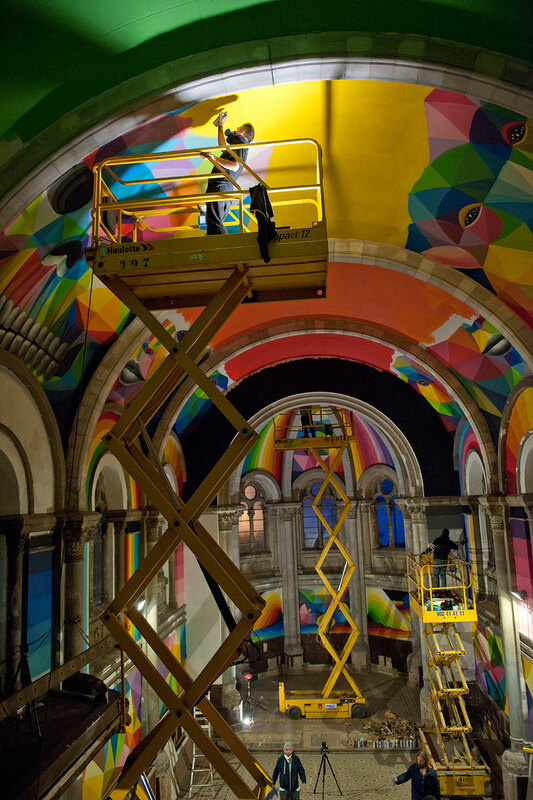 It may have taken 7 days and a church full of scaffolding for Okuda to complete his impressive work but when doors finally reopened on December 10, 2015 the delight of the public was palpable. Suffice it to say that professional skateboarder, Danny Leon, who inaugurated the space, required no introduction to the community of gathered skate lovers. 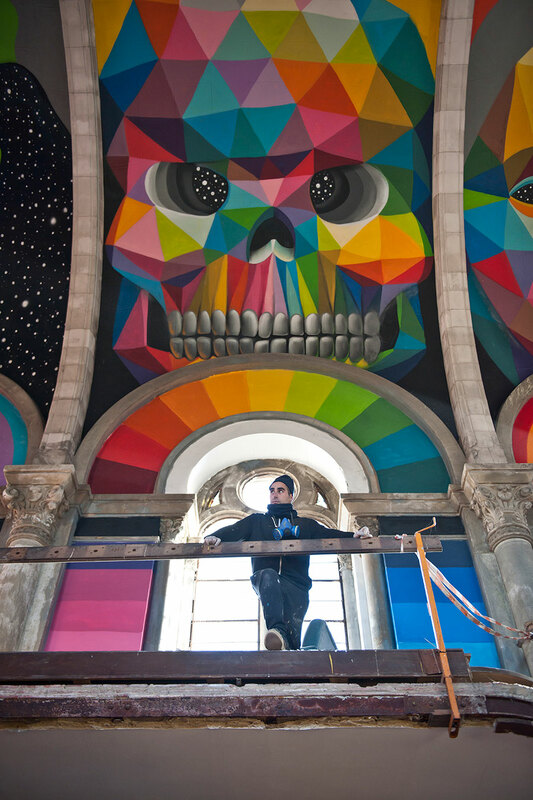 Kaos Temple is now open for skaters who wish to practice in the unique skatepark as well as for contemporary art enthusiasts who long to marvel at Okuda’s scope of fantastical imagery. 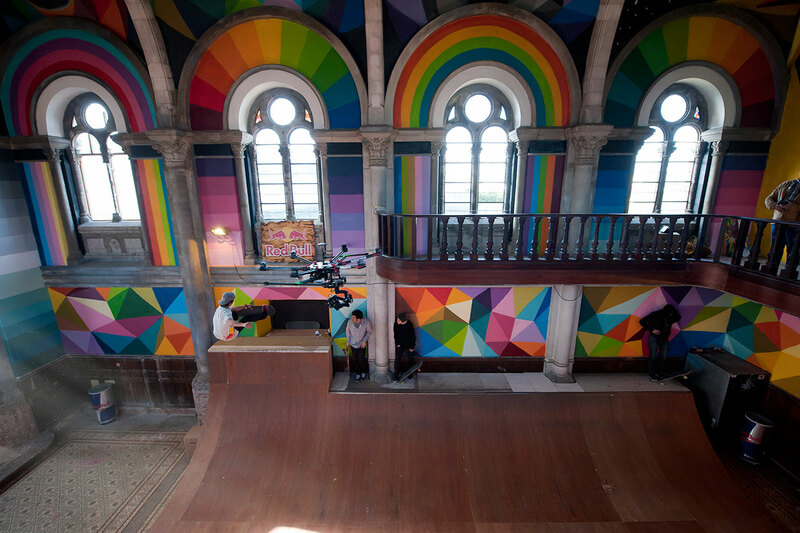 The marriage of skateboarding and art has definitely found the perfect spot for coexistence in Asturias.